Motorola C450 is almost a copy of C350, this an example of how the phone C350 should have become originally. Design remains almost the same. The only difference is that it became thicker (2mm), now the dimensions of the phone are 98 x 42 x 20 mm. It was made to integrate a battery of increased capacity. Now the phone is equipped with the battery of 750 mAh (not 650 mAh as C350) capacity. Increased capacity provides 6-12 “extra” hours in standby mode. The phone operated about 3-4 days in case of 20-30 minutes of talking. It’s interesting that batteries from C350 are compatible with C450 and vice a versa. In case of C350 you should put back cover from C450, otherwise the battery is too projected. The covers of these models can be replaced, but if you set covers from C450 to C350, there will be free space between the cover and the battery. Taking into account that covers from C33x were compatible with C350, they would be compatible with C450 too (the new battery should be changed to not so capacious battery). The weight of the phone was slightly increased, now it weighs 6g. more (totally 86 grams). It’s quite sufficient. 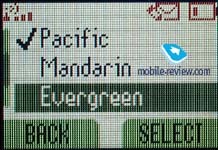 The phone is equipped with STN 4096 colors screen (96x65 pixels). 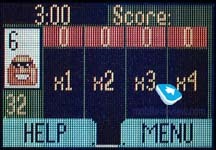 Up to 3 text lines, tips to the soft keys use and line with icons can be displayed on the screen. 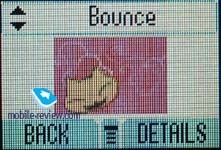 The quality of the screen loses to other manufacturers, for example, Nokia and Alcatel. But it is quiet demanded in its price segment. The keypad of the phone is made of plastic. All alphanumerical keys are ribbed. They are very convenient and easily pressed. On the contrast, navigation keys and soft-keys are not so comfortable. Menu-key, which is situated in the navigation key, is not handy; a scroll-up key is desired to press instead of Menu-key, as a respective indicator is placed above this key in the stand-by mode. Two rows of characters are drawn on the keys in the Russian version of keypad (Cyrillic and Latin). The keypad has a white backlighting, all characters are easily seen in artificial lighting conditions, they are not coherent by the bright light. Mini-USB slot is placed in the bottom of the phone, it can be used to synchronise data with PC or as a high-speed GPRS modem. Cable and software are not included in the standard delivery kit. Near this slot one can find a charger connector and portable handsfree connector. SIM-card holder is positioned under the battery in this phone. 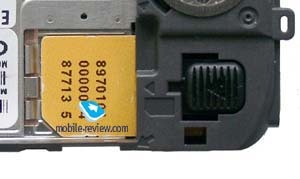 To remove a Sim-card it is necessary just to move a slidebar. It’s very simple solution. Finally we could add that hardware platform was changed. The new phone has “hardware” clock, now if you remove the battery you won’t reset time after filling it in. 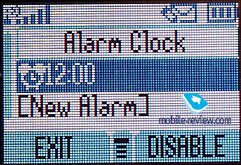 Due to real time clock function (RTC) it also becomes possible to integrate alarm clock as a separate function. It was not typical for the phones from Motorola. Two described models are very similar, so, we can quote a review of Motorola C350, but, firstly, let us mention the main differences of the new model. Firstly, as we’ve already said, the separate alarm clock was appeared in C450. Secondly, a possibility to download Java applications was added. C350 supported Java, but the user couldn’t renew or delete the applications. Now there is a respective menu item. Total memory pool was also increased, now it it 2 Mb, not 1 Mb as it was earlier. The memory pool is shared in the following way: 950 Kb – Java applications, including pre-installed ones (size of one program can’t exceed 512 Kb); about 700 Kb can be occupied by ringtones, pictures, screen savers and so on. 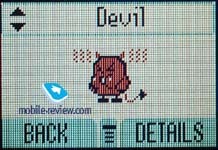 I our opinion, it is impossible to delete them; about 350 Kb are used to store own ringtones, pictures, etc. 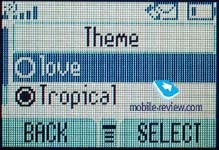 The last new function is MMS-messages support. The phone operates in the same way as Motorola T720i. Only one page is available in one message. Unfortunately only one picture could be added. 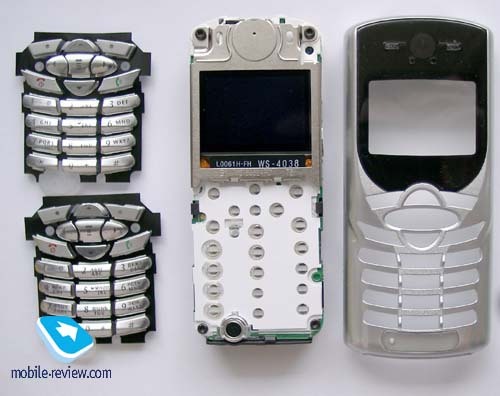 Below we’ll describe the main features of the phone, which absolutely repeat those one of Motorola C350. Certainly, several wallpapers were changes, as well as some other pre-installed pictures, but it was available on C350 too. 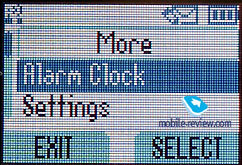 The main menu structure of C350 is typical to all last phones from Motorola. It is a circle of icons with tips. Shortcut number navigation is not available. But there is MyMenu function, which can substitute this feature. You can create a shortcut for each menu item and then you need only two pressures to reach a desired menu item. Phonebook. Up to 100 phone numbers can be added to phone memory. Several phone numbers can be added to one contact, but the total quantity of phone numbers can't be more than 100. 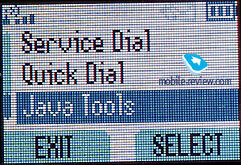 Phone numbers from both SIM-card and phone memory are displayed in the list. 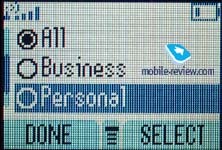 All names, which have several records, are displayed several times and an icon of the phone number type is displayed near each number. 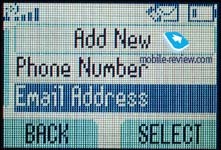 You can also add e-mail addresses to your phonebook and divide all records to the caller groups. 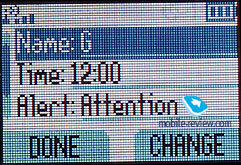 Besides, you can associate a special ringing tone and icon, which is displayed while incoming call, to each name. Also it's possible to add up to 25 voice tags to phone numbers. Voice recognition works correctly. Messages. 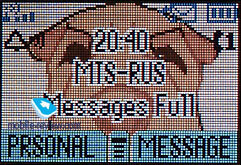 Up to 20 SMS-messages can be stored in the phone memory. 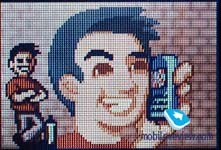 SMS chat feature is available. You can also create templates. 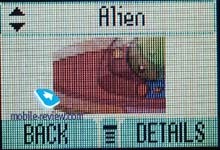 The phone supports EMS, so, there are pictures and melodies, which can be used while creating SMS message. We need 4 seconds to open a message. Experiments with other SIM-cards showed that this time was almost the same for all of them. We think that a limitation is time of picture drawing, not time of information read-out. Media Centre. You should use this item to preview images, animated pictures and melodies. MotoMixer - a musical composer, is also located here. It helps to compose own ringing tones. Totally, there are 35 pre-installed melodies and space for 32 other melodies. New function that is appeared in this model is themes. Now you can change wallpapers and screen savers on your screen. Chat. 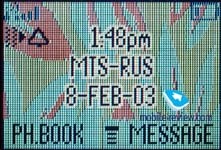 SMS-chat is located in this menu. We are not sure that it was necessary to create a special menu item in the main menu for this feature, because it is not often used. Voice dialling. It is also a special menu item in the menu. It’s not very convenient that this item is not located in the phonebook menu. Up to 20 voice tags can be added to phone numbers from the phonebook. It’s pleasant that you can view all names, which are assigned to voice dialling in one list. Settings. As always you can find security and wap-browser settings. Besides, you can select a menu language and a backlighting duration, change a wallpaper (animated or static). 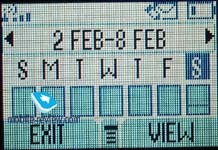 You can also set time, which shows in how many minutes selected wallpaper will be displayed. Firstly, a backlighting is switched on to view an image on the screen. Office tools. 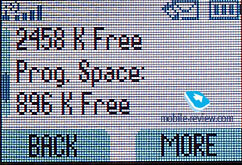 Up to 500 phone numbers can be stored in the phone memory. Alarm-clocks are absent, organizer records can substitute them. There is an autodelete function of old records, a possibility to create a reminder and even recurrent event. Calendar is almost absent. You can see one week on the screen. 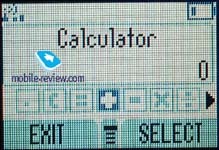 Standard calculator is also located here. Ring Styles. A user can find all settings connected with rings here, nothing special. Recent calls. This menu item is highlighted when you enter a menu. You can view 10 last dialled calls and 20 received and missed calls there. It’s interesting that when you press a send key in the stand-by mode, you can see only a list of dialled numbers. 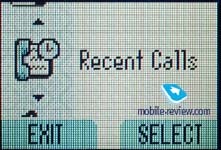 To view a list of missed calls you should enter the menu (3 operations or 2 ones if you add this item to MyMenu). It’s not convenient that you can view an information about missed calls only once, then they are indicated as received calls. Here you can also view information about calls duration and received and transmitted data (bytes, minutes). Quick Dial. You can assign phone numbers to the speed dial keys. Fixed Dial. The same as Quick dial, but only 3 phone numbers can be assigned to it. Web Sessions. All settings for WAP via CSD or GPRS are placed here. Browser. 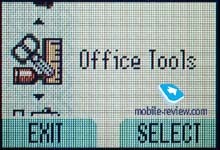 The phone has a standard wap-browser in version 2.0. Web Access. It is a dubbed access to Wap-browser, also one can view history, favourites and saved pages here. Games. There are 3 Java-games here. 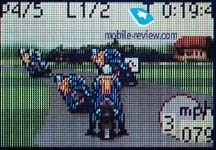 One of them is the same as in T720 (MotoGP). It’s not so pleasant to play because of the worse display but you can waste time playing it. 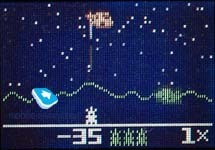 Astrosmash – a space arcade. Snood21 is a card game. 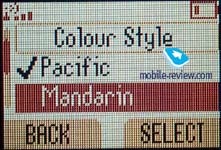 In response of reception quality it correlates with Motorola C350. It means that there are no problems with connection, the phone provides good connection. Volume of 16-tones polyphonic melodies is not high, one can easily miss calls. Vibrating alert is average, it is not strong and doesn’t help to improve the situation. The novelties of the phone in comparison with C350 are the following: more capacious battery, full Java applications support, increased memory pool, MMS support. The model will be shipped to European market in the end of September, an expected price will be about 120 Euro. We are not sure that it would be a successful model, taking into account that a cheaper version of this handset – C350 would be also available. Not many users in this segment need MMS and Java and are ready to pay about 20-30 USD for these functions. On the other hand, new users could pay attention to C550, which offers the same functionality and has an integrated digital camera.